Career Services will host the 25th annual Empire State Career and Placement Exchange (ESCAPE) conference at the Syracuse University Sheraton Hotel and Conference Center on Tuesday, July 28, from 10 a.m. to 3 p.m. ESCAPE is a one day, drive-in style conference for career services professionals from colleges and universities across New York State. 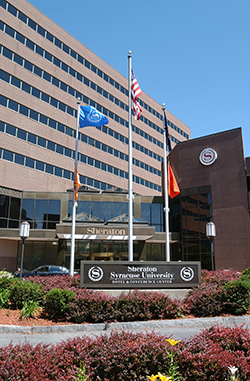 The Sheraton Hotel University Inn & Conference Center will be the site for the ESCAPE conference on Tuesday, July 28. This year’s ESCAPE conference will feature keynote speakers John Robinson ’90 (Newhouse), president of Our Ability, Inc., and Karen Knapik-Scalzo, associate economist in the Division of Research and Statistics of the New York State Department of Labor. Registration for the conference is open through July 8. This year’s registration fee is $50, with a discounted fee of $40 for breakout session speakers. The registration fee covers a continental breakfast, a buffet lunch and parking. All career service practitioners are encouraged to attend this excellent professional development and networking opportunity. To submit a proposal to speak during a breakout session, visit the ESCAPE 2015 proposal page. Proposals are due by June 26. For more information and to register for the conference, visit the ESCAPE 2015 registration page. For questions, contact Tracy Tillapaugh, assistant director of counseling in Career Services, at ttillapa@syr.edu.